Calc and Excel take two slightly different approaches to creating charts from data. For Calc the first step is opening the Chart Wizard or selecting the data range. If you open the chart wizard first, it is easy to select the data range later. Excel has the user select the data range first. The next step is to choose the chart type. It will not allow you to choose the chart type first. There are 11 categories to choose from (covered in Chart types section). These include, bar, line, and pie. After choosing the desired type, select a desired style. Then adjust the other settings. Step two is where you set the columns and rows that are to be represented in the chart. The range can be typed in. However it may be easier to highlight the desired cells before launching the wizard. Next, choose the rest of the settings. These are explained in this article. This allows you to make adjustments to the data range. You can add to the series or delete from it, select which ranges you want to use for border color and fill color. This allows you to add a legend, title, add labels to the X and Y axis, and make gridlines visible or invisible. Unlike Calc, Excel does not use a wizard. After highlighting the data range, the first thing to do is choose a chart from the Insert ribbon. Click Insert at the top of the document window to reveal the Insert ribbon. Click one of the desired chart types to reveal a menu with the choices for that type. Highlight the desired choice to see an example of it. Each menu only contains a sample selection of all of the charts in its type. If you want more choices, click the More Charts item at the bottom of the list to open the Insert Chart dialog. This dialog is like the wizard in Calc. However it only offers more choices than the Insert ribbon. It does not take you through a series of steps to create the table. Instead, Excel takes you to a Design ribbon under a section called Chart Tools. This ribbon allows you to change the color scheme of the chart, switch rows and columns, and choose a range of data, among other things. The Design ribbon gives the Excel user a more open user interface than the Calc user has with the wizard. The wizard needs to be closed before returning to the spreadsheet. In Excel, the user can simply click on another ribbon to perform other functions. If he decides to perform other functions in the spreadsheet before creating a chart, like fixing some numbers, he is not forced to abandon and restart the chart creating process. The ribbon also makes it easier for the user to complete the chart in a non-linear fashion. He can easily choose the styles and colors of his chart before setting up the data range. This is more difficult to perform in Calc’s wizard. The wizard, however, aids the novice chart designer more than Excel because it has the steps. There is also an easy to follow tutorial in the help section, if the user needs to manually type in the data range. If you are not familiar with the notation for data ranges in Excel, it is not as easy to find information on it. The Select Data Source dialog that opens when you click the Select Data icon does not have default notation like Calc has. The article that launches in your Web browser when you click the question mark also doesn’t have it. To select a data range by highlighting, you need to click off the chart. When you click back on the chart, the cells you highlighted are no longer highlighted. The novice user needs to select the data range before selecting the chart. If cells are not adjacent, he will have to know the notation. Excel does not give him immediate help with it. Excel and Calc have the same categories of charts, for the most. They have 10 of them in common. The below table shows categories the two have in common. Calc has a separate category for its Bubble chart. Excel has two bubble charts in the XY (Scatter) category. Excel places the charts in a section called Radar, Excel puts them in the Net category. While Excel offers these as pre-defined in its dialog, LibreOffice Calc users are not without hope, if they want to create some of these types. There are videos and articles from users who demonstrate how to create several of them. The map chart will show data in various geographic regions. For example, a sales manager of an international retailer could show sales performance of each one of its stores. The map would show that stores in London, England had higher sales than the stores in New York City and Beijing, China. These maps are dynamic and can adjust when data in the cells is changed. It uses Bing data to create the maps. This article explains how to create a map from data. Calc does not yet have the ability to create a geographic map with data, at least not without a plugin. This page has a plugin that can be installed in Calc. The information presented in this article shows how the sales of different novel genres performed over a four year period. Different colors represent different ranges of sales numbers. Each genre fits into the different ranges on different years. The surface chart shows the genres when they are in the same data ranges. Calc does not have the ability to create a surface chart. However, a radar chart or Net chart (as Calc calls it) can display the same kind of data. This chart shows a hierarchical view of data and helps in spotting patterns. They are good a showing proportions within the hierarchy. This article gives an example. Calc does not have a treemap choice. It is not easy to create something similar. These type of charts show the distribution of data. While it looks like a bar chart, it is not the same thing. Histograms are used to show distributions of variables. Bar charts are used to compare variables. Histograms plot binned quantitative data. Bar charts plot categorical data. 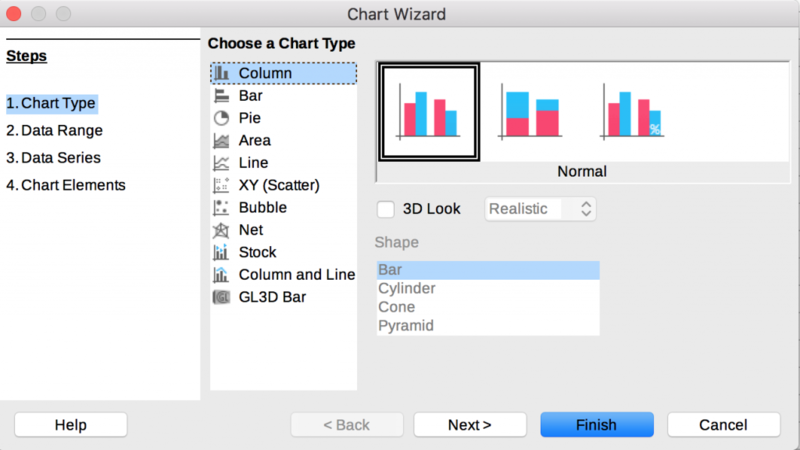 Bars can be reordered in bar charts but not in histograms. Calc does not have a pre-defined choice for histograms. However, several users have created videos on creating them. This is also a chart for displaying hierarchical data. It has multiple rings. Each ring represents a level. The example in this article shows. It is effective at showing different pieces of data in a ring. This is different from a doughnut chart. This chart, like a histogram, shows distribution of data. Whiskers show the spread of all the data. The video from Khan Academy shows that trees surveyed range between eight and 50 years old. The box shows three medians. It shows the median for all the trees surveyed, which is 21. It also shows the medians for the trees less than 21 years old and for those greater than 21. This type of chart is good for visualizing the mean and outlying data points in four separate sections. There is not a pre-defined choice for box & whisker charts, but several users have created videos explaining how to do it. This shows a running as values are added and subtracted. Columns are color coded so positive and negative numbers can be easily seen. This is a type of column chart that can easily be created in LibreOffice Calc. This Web page has an example of a waterfall chart. These charts are typically used to show different stages in a sales process. The values decrease going down the chart, so it looks like a funnel. Here is an example of one. With LibreOffice, one can be created with flowchart tools. Both Calc and Excel have these. Calc has a category called Column and Line. It has two choices which are a combination of column and line graphs. 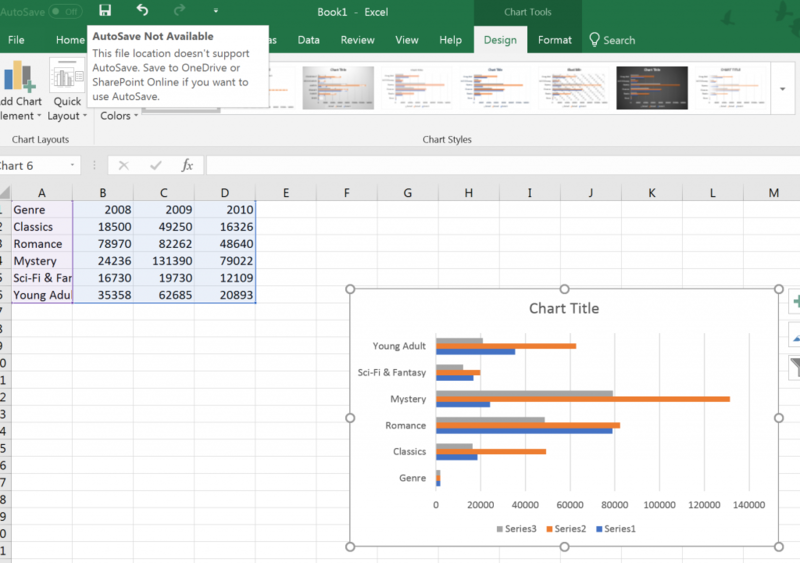 Excel allows you to combine several charts of your choosing. When it comes to charts, Excel is more advanced than Calc in almost every way. It simply has more chart types to create. While Calc can create a chart to display most types of data, it lacks some important ones, such as a map and a sunburst. This means that Excel is a better tool for creating visuals for certain types of data. However, the wizard in Calc makes it a better tool for novices because it guides you through the different steps of creating a chart. 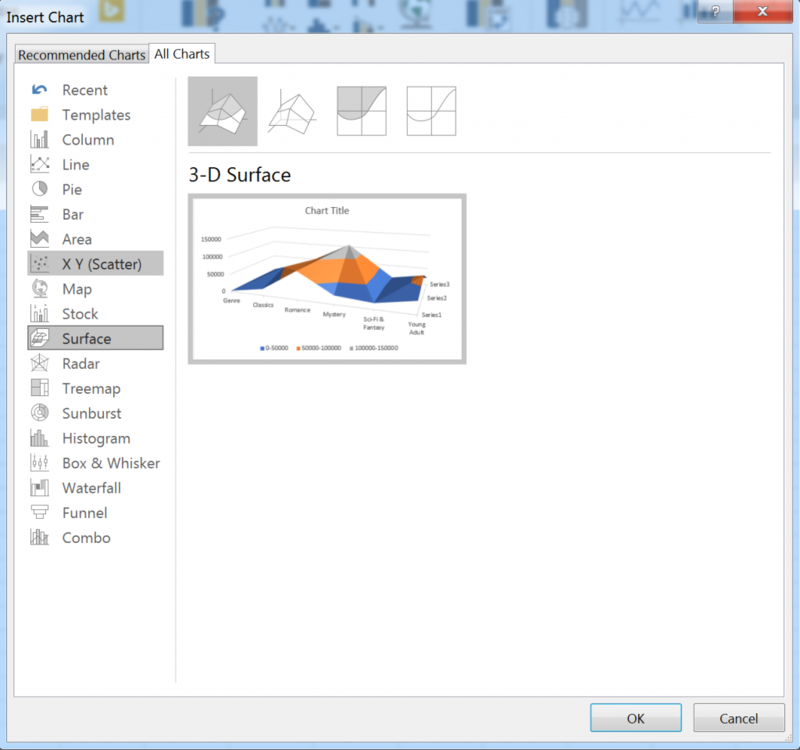 The wizard allows you to see how the data looks in each type of chart. It then guides you through setting data ranges and stylizing a chart. Excel doesn’t guide you through setting up a chart like Calc does, but it suggests charts based on the data you have selected. In this way, it helps the novice user in a way Calc does not. There are ways that Calc beats Excel for Windows. It has several features that the popular spreadsheet does not. For charts, however, it is a step or two behind. Use Excel when creating charts that are not available in Calc. It is also better if you are not sure about which chart would work best for the data. For the novice, Calc is better for complex data ranges.